It’s worth remembering that a bespoke overcoat is the first thing people see. Plus, what’s the point in buying a beautifully tailored, bespoke suit, only to squash it underneath an ill-fitting overcoat? Apart from helping to you to look good, the main job of an overcoat is keep you warm through the colder months of the year. With the right care, a bespoke overcoat is an investment that should last a lifetime. Here, we’ve put together our top tips for what to consider when buying what some consider to be the ultimate bespoke statement piece. Buying a coat made from a 100% heavyweight wool coating is your best bet as it’s guaranteed to have a long life. In general, heavier cloths last longer and weather better because the cloth is more durable. If you’re in the market for something lighter in weight and more luxurious in both feel and finish, there are wool cashmere and wool alpaca blends that are worth considering. Your coat sleeves should cover your suit sleeve completely, as well as your shirt cuff beneath, thereby avoiding any gaps at the wrist when you wear gloves. Traditionally, overcoats were cut very long, extending almost down to the ankles. Also known as a full-length coat, these are often the choice for our older clients as they are better able to accommodate a wide range of shapes and sizes. Most of our younger clients opt for coats cut to the knee, which is more complementary for those with a slimmer build. 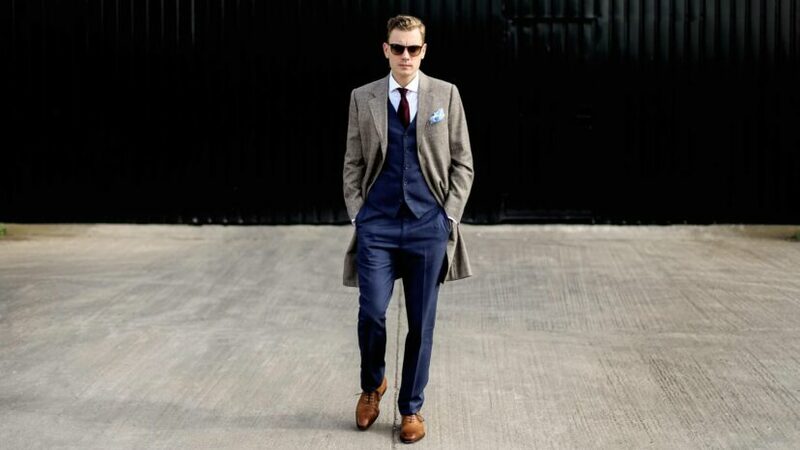 When buying an overcoat, always wear a shirt and a suit jacket underneath to obtain the optimum fit for the coat on top. Very much down to the individual, it’s totally up to you what you choose. A single-breasted, notched lapel is a more standard choice, while a double-breasted peak lapel lends a little more formality, as well as providing additional warmth with its double layer of fabric covering the chest area. Our coats have either a half or full sewn canvas, depending on the type of construction you choose – machine made, half hand made or fully bespoke. A sewn canvas makes the coat more durable, helps to add shape and contours for the body.